On this day we commemorate the Holy Seven Virgins of Ancyra (Tekousa, Alexandria, Claudia, Phaine, Euphrasia, Matrona, Julia, Theodoti) and Theodotos the Martyr. Thrown into a life streaming with joy. Glad to stand next to the throne of your Savior. 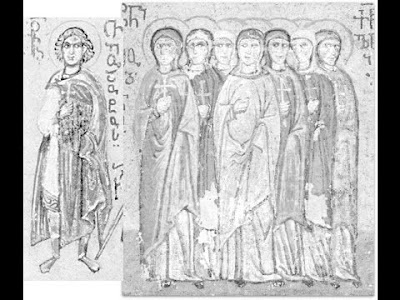 These Holy Seven Virgin Martyrs were from Ancyra in Galatia. Saint Theodotos, although he had a wife, it was through the care of his wife that he did not neglect piety and virtue. With diligence he would buy wheat and bake bread, and these he would first offer to God and then to the poor. He did this because the defiled governor of Ancyra, whose name was Theoteknos, ordered that the foods sold to the Christians be sprinkled with the wine sacrificed to the idols. Therefore the blessed one would go to the prisons, encouraging the imprisoned Christians there in their faith in Christ, and he would give them survival food. One time when he went to the prison, he saw the seven Virgins, one of whom, whose name was Tekousa, was his aunt. These women were therefore brought before the governor, and because they refused to sacrifice to the idols, they were handed over to soldiers to be dishonored by them. By the grace of Christ, however, they were kept unharmed and without corruption. They then tied rocks to them, and threw them into a nearby lake. In this way the blessed ones received the crown of martyrdom on May 18th, in either the year 303 or 304. 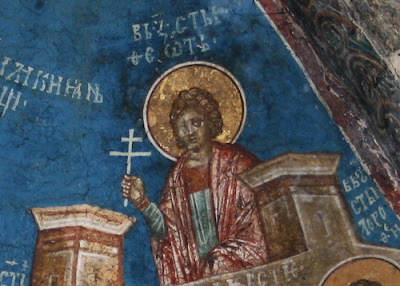 The following night Saint Tekousa appeared to Saint Theodotos in a dream, asking him to take her body and give it a Christian burial. Saint Theodotos went to the lake, taking his friend Polychronios and several other Christians with him. It was dark, and a torch illumined their way. The Holy Martyr Sosander appeared in front of the guard who was posted by the pagans at the shore of the lake. The frightened guard ran off in terror. * It should be noted that we also commemorate seven virgins with the same names from Aminsus, Cappadocia who are celebrated on March 20th. There may be some confusion between the two sets of seven virgins, but they were martyred in different places by different means. ** Saint Theodotos is also celebrated on June 7th. Your Martyrs, O Lord, for their sufferings, have received incorruptible crowns from You, our God. For strengthened by Your might, they overthrew tyrants and destroyed the powerless boldness of demons. Through their supplications save our souls. Suffering martyrdom worthily, with those who suffered with you, O Theodotos, you received crowns of honor with holy virgin martyrs. Therefore entreat Christ God unceasingly on behalf of us all.